The Zoll AEDPlus is an automated external defibrillator (AED) intended for lay first responders trained in basic life support and healthcare professionals trained in advanced life support (ALS). It is designed to be portable and is available with either a graphic user interface for lay users or a professional interface. However, a possible disadvantage is that it requires a PC for configuration. 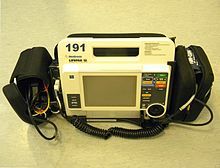 In addition, the professional interface version intended for advanced users does not have a manual mode which could be useful for emergency defibrillation where medical staff are not familiar with the device. On the other hand, it does not need a propriety battery cartridge’s using commercially available non-rechargeable lithium batteries which can reduce consumable costs. And it comes with disposable, self-adhesive defibrillation pad sets with a built-in aid for the delivery of CPR. The device has a hard cover that can be removed and placed under the patient’s shoulders to maintain an open airway during resuscitation. Overall, the device is a compact AED suitable for lay users, first responders and emergency services.